Did you ever notice how the color red makes you suddenly feel hungrier (or, for some, angrier). Or how a great blue sky can instantly calm you down? Maybe orange lifts your spirits while green soothes your senses. Color therapy is a real thing, and a really powerful thing at that. It’s the reason royals wore purple, the psychology behind the paint job in your therapist’s office. Color plays a major role in our life. If it didn’t, we’d be meant to see everything in black and white. I don’t know about you, but I don’t really have time or the budget to change my paint colors based on my mood! Besides, I rent, so I’m pretty sure my landlord would get ticked if I was constantly repainting the whole house. 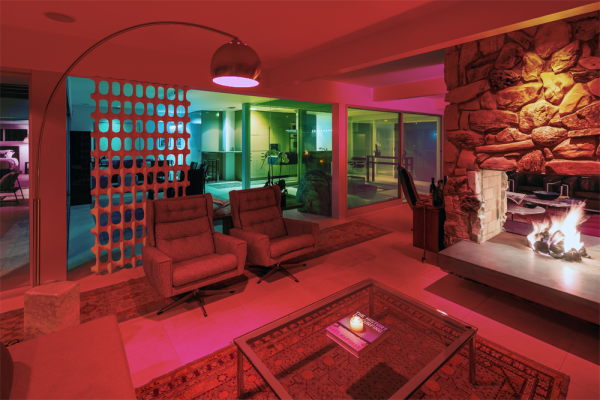 Colored light is a great way to change the atmosphere, but again, who has the time or money to constantly switch out bulbs. 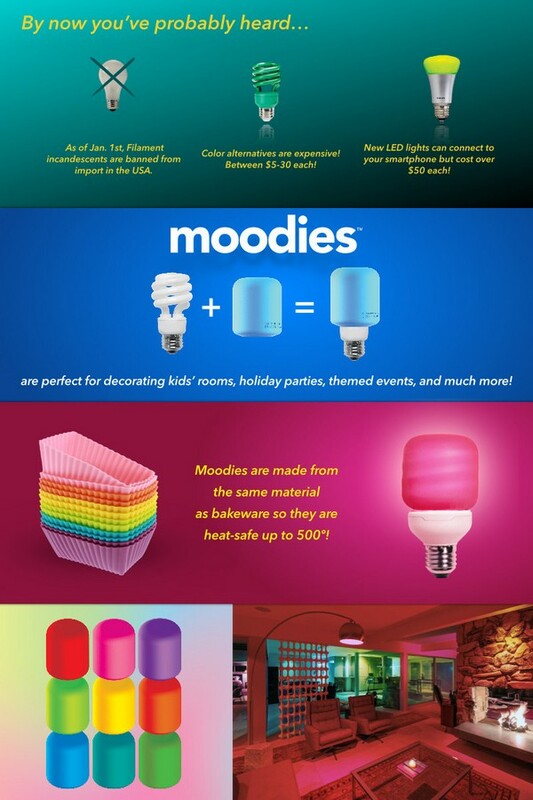 Moodies silicone lightbulb covers are the coolest solution ever. 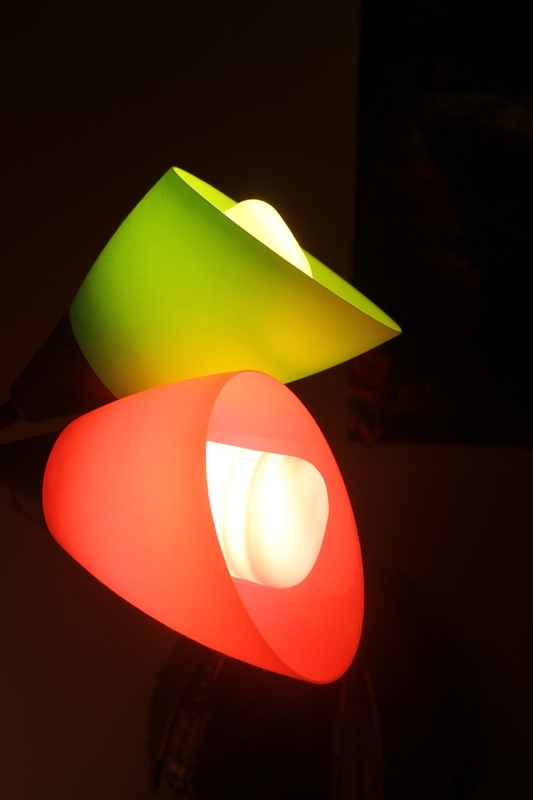 I received a fantastic selection of Moodies heat-safe silicone light-bulb covers for this review. The minute we got them, my son wanted me to try them out in his room. 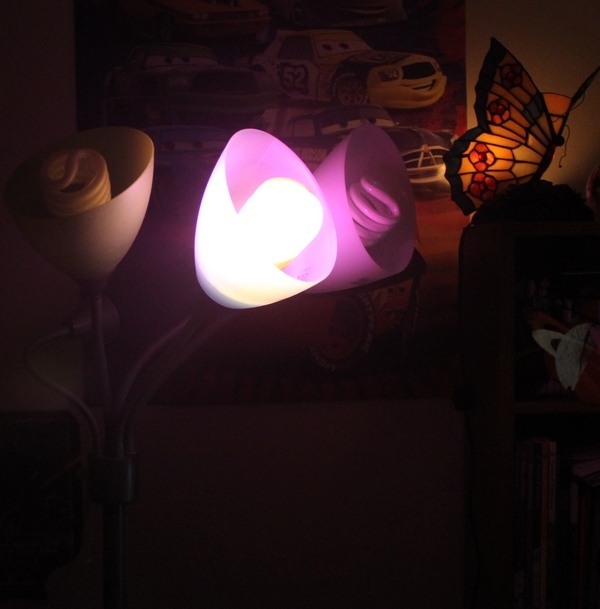 We have one of those lamps with five bulbs (like a flower kind of), so we decided to try it on one. I had to unscrew the other bulbs to get the effect Jacob wanted. This picture didn’t come out as good as I hoped. I am still learning the non-auto settings on the DSLR. We also did yellow and orange for two of the other light bulbs. They don’t show up as well in the picture. The effect is so much cooler in person. Like I said, I’m still trying to learn how to use the settings on my camera to take really good pictures in different lighting. This picture below is from the Moodies website, in a much cooler house than mine! Seriously, isn’t that house awesome??? WANT! If you look at that infographic above, you’ll notice a few key points that I want to discuss further. First. 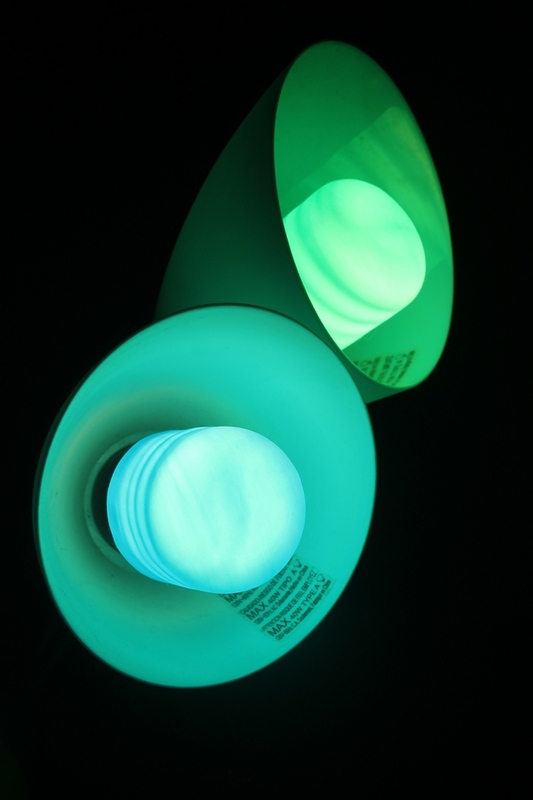 Moodies are designed to fit over a CFL or LED lightbulb. They are not safe for, nor will they properly fit over, the old-fashioned incandescent energy hogs that we grew up with. About time to get rid of those things anyway, right? Second, Moodies are made of silicone, the same material that you bake your awesome cupcakes in (should you be inclined to baking). That means they can withstand the heat of your CFL or LED bulb. I am super paranoid about fire hazards. I actually touched them a few times to see how hot they were. I didn’t suffer third-degree burns, so that should tell you something! Yes, I touch hot things, no, I don’t touch the stove to see if the burner is working. I do have SOME degree of common sense. Seriously, they get about as warm as the bulb itself. We are totally mad for Moodies here. 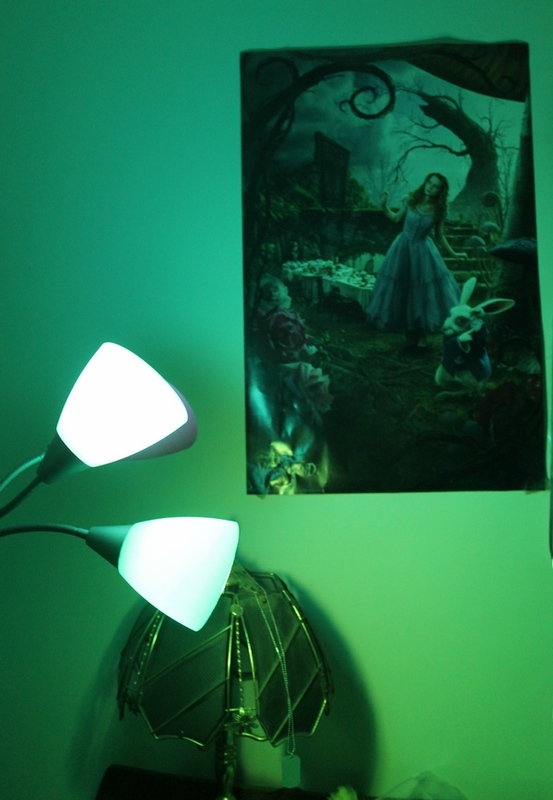 I especially love the blue and green effect in my room. The combination helps my son fall asleep at night, and it’s a great way to relax during our bedtime routine (which usually involves me talking in a weird voice with one or more stuffed animals). Moodies come in pretty much every color of the rainbow. In fact, you can get a rainbow pack for a special price of $19.99. That’s about $2.50 each. You can also get single Moodie colors for $3. Buy the rainbow pack, it’s worth it! Head to the Moodies Online Shop to grab them. Check out Moodies on Facebook for some fun color inspiration.